Wood-Mizer, the world's leading portable sawmill manufacturer, announces the sponsorship of an urban wood seminar at the International Woodworking Fair in Atlanta, Georgia. Jennifer Alger of Far West Forest Products salvaging pieces from a fallen urban tree in Sacramento, CA. 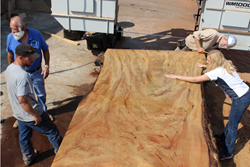 While Wood-Mizer has been educating woodworkers about the positive environmental and economic impact of urban wood for years, the Urban Wood Seminar at IWF 2016 will be another step forward in saving more trees from going into the waste stream. Wood-Mizer LLC, the world’s leading portable sawmill manufacturer, announces the sponsorship of an urban wood seminar at the International Woodworking Fair in Atlanta, GA. The Full Circle Urban Forestry Network comprised of Illinois, Michigan, Missouri, and Wisconsin members is presenting the free 90-minute seminar on Friday, August 26th at 1:00 p.m. at the Georgia World Congress Center. Panelists for the seminar include urban wood experts Jennifer Alger of Far West Forest Products in California, Rick Siewert of Wood from the Hood in Minnesota, and Dwayne Sperber of Wudeward Urban Forest Products in Wisconsin. The Urban Wood Seminar is free of charge, but advanced registration is required to guarantee a seat. Learn more and register at http://iwfatlanta.com/Education/NBS6.